It's big (ad) world, but we aim to make it feel even smaller by highlighting inventive, global ads, monthly, that break the mold from the mundane handpicked by ThinkLA Board Member and Award-Winning Creative, Luis Camano. To capture that global spirit, we will feature inspiration from outside of the U.S. If you don’t already know it, Lego Technic let’s you build things for real. How about a drivable Bugatti? Yup! Great activation of a partnership. And very engaging content. Omo/Unilever in South Africa has found the formula to separate kids from their screens. To the delight of parents everywhere. Carlsberg/Denmark shows us the Danish way of living in a mini documentary series. And what people will do for a beer. It's big (ad) world, but we aim to make it feel even smaller by highlighting inventive, global ads, monthly, that break the mold from the mundane. To capture that global spirit, we will feature inspiration from outside of the U.S. and sometimes from brands that we've never even heard of! ThinkLA couldn't be more grateful for Luis Camano, ThinkLA Board Member, award winning creative, and an expert in the field of Brand Activation, for being our Global Warrior and bringing these to our attention. We hope that Global Wednesdays inspires our members as much as it does us. 1. Absolut. Playing along its tagline "The vodka with nothing to hide” here’s an awkward, yet totally natural, employer’s introduction video. This is for real. 2. From Sweden, VW's contribution to safer roads. A very powerful reminder without the usual shocking images. 3. Boston Pizza has created the perfect Father’s day gift. My vote for year-long availability. It's big (ad) world, but we aim to make it feel even smaller by highlighting inventive, global ads, monthly, that are breaking the mold from the mundane. To capture that global spirit, we will feature inspiration from outside of the U.S. and sometimes from brands that we've never even heard of! ThinkLA couldn't be more grateful for Luis Camano, ThinkLA Board Member and Head of Innovation and Brand Activation LC/BA, for being our Global Warrior and bringing these to our attention. We hope that Global Wednesdays will inspire our members as much as it does us. 1. Muji, the Japanese company that sells “no-brand quality goods”, has created an eye-popping installation for the Holidays (made entirely with pens, of course). 2. Beer plugs from Denmark. Enough said. Beer Plugs | Tuborg from CP+B Copenhagen on Vimeo. 3. Here’s how to make a promotion exciting and participatory. Plus generating a ton of content from consumers. 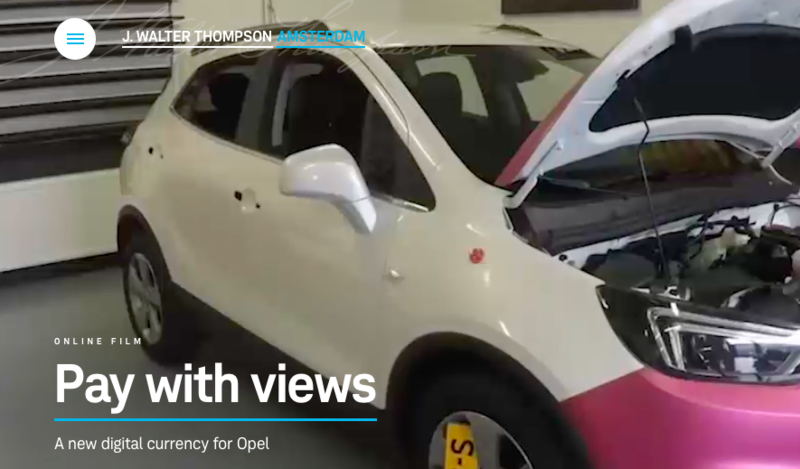 Opel - Betaal met views | Compilatie inzendingen from J. Walter Thompson Amsterdam on Vimeo.